On Monday 4 January 2010, one of the two new UCI ProTour teams got presented in London: Team Sky. The British team, created from scratch, will ride its first race in the Tour Down Under 2010. In this article you'll find information about the riders of the team, the team's philosophy, the team's sponsors, the team's website and other online presence, the team's jersey/kit and bike. 26 riders will form Team Sky in 2010: 25 riders coming in from other professional cycling teams and one neo-pro (the British Peter Kennaugh). This Norwegian rider came to Team Sky from Saxo Bank where he was a team captain as one of the older riders. He won one stage in the Tour de France 2008, two in the Giro d'Italia (2003 & 2007) and several other races. He describes himself as a flexible type of rider. You can put me anywhere and I'll be okay. If I can prepare, I'll be decent - I'll be okay, indicating that his favourite races are the cobbled classics. His role model was Laurent Jalabert. This South-African rider comes from the British team with a South-African sponsor, Barloworld and he's a climber. You probably remember him from the 2008 Tour de France where he arrived first at the top of the Col de la Bonette-Restefond during the Cuneo > Jausiers stage. Indeed, he's the guy who missed a corner and landed a few meters lower. He managed to climb back to the road but his bike was still down there ... (you can see this happening in this video on YouTube) and he missed his opportunity to maybe win a Tour de France stage. At Team Sky, John-Lee Augustyn will in 2010 focus on one-week stage races, mainly in Spain. This experienced Canadian rider comes from Columbia-HTC and will do his 12th season as a professional rider with Team Sky in 2010. About his role in the team he says: I don't know if there's a 'captain', but I'm one of the veteran riders, and acting as captain on the road was something I enjoyed doing with my previous team. It's nice to see younger guys progress, and be able to contribute a bit to that. He added The last couple of years I've often worked as a domestique, and I'll have a similar role at Sky. I'm a type of rider they can count on in all terrain. But in hillier, harder one-day races I can do alright for myself, too. This 22 year old all-rounder from Norway comes to Team Sky from Columbia-HTC. In 2009 he won Ghent-Wevelgem, one stage of the Giro d'Italia, four stages and the overall in the Tour of Britain, three stages and the overall in the Eneco Tour and two stages in the Tour of Poland. Thanks to these victories EBH is seen as a very promising young rider. In 2010 he will mainly target the spring classics ("I like the cobbles"), but he would also love to do his first Tour de France ... but that might be a target for 2011. Calzati is one of the two French riders in the British team and comes from the Agritubel team. His main victory so far is the stage win in the Tour de France 2006 when he managed to escape from a six-man breakaway. In 2010 his goals are the French races: Paris-Nice, the Dauphine-Libere and Tour de France - they are my goals while admitting he has to prove he deserves a place in the Tour team (that is ... if Team Sky gets selected to participate in the Tour). Carlström is the only Finish rider in Team Sky and since he's the Finish champion he will wear a specific Team Sky Finish champion jersey. Coming from Liquigas, this all-rounder's best personal result is a stage win in Paris-Nice 2008, beating Clément Lhotellerie in a sprint. His first race in 2010 will be the Vuelta a Andalucia. This UK born Italian comes from the Italian team ISD and is an experienced rider with no less than 16 Grand Tours which he almost always finished: 4 times Tour de France, 7 times Giro d'Italia and 5 times Vuelta a España. As a climber his best result was when he ended 4th in the Giro d'Italia 2004 and he says his British grandmother (he has a British mother and an Italian father) is probably the most proud family member since he announced joining Team Sky! Steve Cummings is presented on the Team Sky website as an all-rounder / rouleur. Coming from Barloworld, his best results are second overall in the Tour of Denmark and the Tour of Britain in 2008. His main goal in 2010 is to obtain a spot in the Tour de France selection for Team Sky, but his first races are the Grand Prix La Marseillaise and the Etoile de Bessèges. This 31-year old Brit comes from the small team Candi-TV Pinarello Racing Team. With that team he won the first stage and the overall of the Tour of Ireland in 2009. His selection for Team Sky was based on that win. As a sprinter he says he'll have a dual role in Team Sky: In the shorter stage races I can maybe pick off a few stages to go for. But I know there are quicker guys than me on the team, and, in the bigger races, I will help them. This Argentina born Spaniard was with the Dutch Rabobank team in the last three years. He thanks his nicknames The Spanish Flandrian and Van der Flecha to his good results in the cobbled classics: Tour of Flanders (3rd in 2008) and Paris-Roubaix (3rd in 2005, 4th in 2006, 2nd in 2007 and 6th in 2009) which is quite rare for a Spanish rider. Even though he also won a stage in the Tour de France 2003, he will most probably focus on the classics again in 2010. Chris Froome is a Kenya-born British rider (looks like they like combinations of nationality in Team Sky!) coming from Barloworld. For Barloworld he rode the Tour de France in 2008 and the Giro d'Italia 2009 and he describes his ambitions by saying: I'd like to become a GC (general classification) rider in the future, but I have a lot of steps to take before I get there. And I'm quite happy to fulfil my role as a team player in the meantime. I'd like to aim for a smaller tour, maybe one of the Spanish stage races, and try to be up there on GC. This 24-year old rider will be part of Team Sky in the Tour Down Under. After his first three years at AG2R, Gerrans has switched teams every year: after one year at Crédit Agricole he had to look for a new team since the French bank stopped its sponsoring and the team disappeared, but his move from Cervélo TestTeam where he rode last year to Team Sky in 2010 was a voluntary one. He won the Tour Down Under in 2005 and took his main stage victories in the Tour de France 2008, the Giro d'Italia 2009 and the Vuelta a España 2009. As for his goals with Team Sky in 2010 he says: The Ardennes classics (Amstel Gold Race, Fleche Wallonne and Liege-Bastogne-Liege) are a big target, then the Tour. I'd love to win a stage of the Tour again. Like Flecha, Mathew Hayman also likes the cobbled classics or, as he says himself: Ghent-Wevelgem and Paris-Roubaix are the two races I live for. In the past few years I've had a serious relationship with those races: some years it's been good, some years bad. We're working on it. In 2009 he finished 4th in Ghent-Wevelgem. This Australian rider has been part of the Rabobank team in the past 10 years. This 33-year old sprinter from New-Zealand comes from the Columbia-HTC team. His sprint has lead to several victories, but the most important one is probably the stage of the Vuelta a España he won in 2009. In 2010 he would like to do the same for Team Sky in the Tour de France, Milan-San Remo and Ghent-Wevelgem. He will be one of the riders in this year's Tour Down Under. 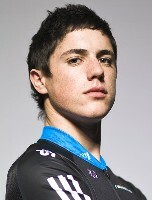 This 20-year old British rider is the only neo-pro in Team Sky in 2010. Team Sky describes him as one of the most promising young talents to emerge from Britain in years. Like Mark Cavendish, Peter comes from the Isle of Man and he has been able to train regularly with the rocket man. In his video interview he says I've never done anything to cycling, so I don't really know what a normal life is! He sees himself as an allrounder but says he cannot say yet what kind of rider he is. But I've got my programme for my first year, with some smaller stage races and good one-day races, including the Tour of Lombardy at the end of the year. I don't know how I'll get on, but I've never felt so motivated. Yet another rider coming from Columbia-HTC and yet another rider from Scandinavia. Lövkvist has always been working hard to become a good rider and he explains this by saying: some guys have more talent, others have less. I have a bit of talent but there are guys with more, so I have to work hard. But I like riding my bike, so I don't see it as a punishment. His ultimate dream would be to win a Grand Tour but even though he says he doesn't know whether he'll get there, there's no point working towards coming in the top ten. The dream has to be to win. This 25-year old Norwegian rider comes from the Norwegian UCI Continental team Joker Bianchi where he won a stage in the Tour of Ireland and in the Tour de Normandie in 2009. This only Belgian rider in Team Sky in 2010 targets the Grand Tours and in his first Grand Tour, the Giro d'Italia 2009, he's proven to be a good rider for such stage races: he finished 2nd in the 15th stage and took two other top ten places while finishing 33rd overall. For the time being his goal is a stage win in a Grand Tour and to show a good performance in mountain stages, but his long term goal is a good general classification ranking. Pauwels comes to Team Sky from Cervélo TestTeam, so -like for Simon Gerrans- this will be his second year in row where he says a new team being built up from scratch. Niko, the 30-year old French rider coming from Caisse d'Epargne, has started his career at AG2R Prévoyance in 2002. From 2003 until 2008 he has participated to the Tour de France every year and he's proven to be a very helpful team mate in the past few years. Suffering from a cardiac arryhtmia he hasn't participated in any races since May 2009. He's happy to be able to make his come-back in 2010 with Team Sky and says Now I am very motivated and enthusiastic. I feel like a new professional. Not being able to ride his bike has probably been quite difficult for him in 2009, but it did give him lots of time to enjoy his new born son, Lenny (born on July 8th, 2009)! For 2010, Niko is looking forward to Paris-Roubaix and the Dauphiné Libéré and would love to ride his 7th Tour de France. The interview on the Team Sky website (there's no video of Nicolas Portal) is one of the first interviews with the French rider in which he doesn't mention his prefered food component ... Nutella! This 25-year old Italian rider comes from Columbia-HTC where he spent 2 years after a 2-year period at Lampre. Possoni could become a big climber in the Grand Tours as he showed with his 9th place in the Tour of Lombardy and his 2nd place in the king of the mountains (best climber) classification in the Vuelta al Pais Vasco. The Italian rider sees the victories in the team time trials in the Giro d'Italia 2009 and the Tour de Romandie 2009 as his best results, but he says that as a climber he doesn't like those victories. His aim is the podium in a Grand Tour, starting with the Giro and maybe the Tour de France. This 22-year old British rider's ideal races are the cobbled classics such as the Tour of Flanders, Ghent-Wevelgem and Paris-Roubaix: I love the classics - in bad weather especially. To win Paris-Roubaix in the rain would be special. Caked in mud - that'd be really cool. Coming from the Italian ISD-NERI team, Stannard has spent his first full year as a professional rider (2008) in the Belgian Landbouwkrediet team. In 2009 he rode his first Grand Tour, the Giro d'Italia. This Australian rider, also known as CJ, is a real sprinter and in 2009 he has won one stage in the Tour of Britain and three in the Herald Sun Tour. He started with the French Cofidis team and spent the last two years before joining Team Sky with Garmin-Slipstream. In 2010 he will play a team role helping other riders and in some races other riders will help him to try to get the victory in a sprint. His uncle Shane is the head coach of the team and a former professional rider in the 80's and 90's. Now 22-year old, Ben Swift started his professional career in 2009 at Team Katusha where he won a stage of the Tour of Britain, finished 3rd in one of the Giro d'Italia stages and took several other top ten placings. About his move from Katusha to Sky he says: I'm massively grateful to Katusha for the opportunities they gave me, but coming to Team Sky feels like coming home, because I know so many of the support staff and the riders. Until 2012 he will combine a road and track career, with the track world championships in March and the London Olympics in 2012 being the main targets and after the Olympic Games he plans to focus on his road career only. He's one of the riders to start in Team Sky's first race, the Tour Down Under. Yet another British rider who has historically combined road and track, but in 2010 Geraint Thomas will completely focus on his road season. He rode his first Tour de France in 2007, as the youngest rider of the Tour, with his former team Barloworld. As many of the riders, Thomas is convinced the highly professional British approach of cycling will work out positively: If we can take the principles behind the success of the track team across to the road, then I don't see why we can't be the best in the world. As a former neighbour, Davide Viganò's idol was Gianni Bugno, especially when he took the pink jersey on the first day of the Giro d'Italia in 1990 and defended his leading position to win the Tour of Italy. Viganò himself is a good alround rider and a sprinter. Last year he participated in the Giro d'Italia and the Vuelta a España with his former team Fuji-Servetto where he finished fourth in one stage of both Grand Tours. However, he prefers the Tour de France rather than the Grand Tour of his own country: I would prefer to ride the Tour because my condition is better in July than in May, when the Giro is on. This Belgium-born British rider, Commander in the order of the British Empire, was quite expected for the team and before his arrival was officially announced it has been rumoured a lot. 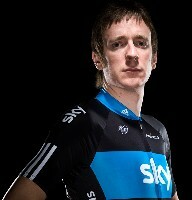 Bradley Wiggins will be Team Sky's leader in the main stage races, the Tour de France being his main target in 2010. Finishing 4th at 6'10" from Tour de France winner Alberto Contador in 2009, he would like to get a podium place in 2010. Coming from Garmin-Slipstream, he comments his move to Team Sky by saying The coaches involved with this team are the people who have shaped me as a rider; they are instrumental in my achievements so far and I know they will be critical in the next part of my career. Team Sky has huge ambitions, not just for the team but for cycling and inspiring the public to ride. It's an amazing project and the next four years will be very exciting. To be part of this team from the start is something quite special. As a 29-year old rider he thinks this is the perfect time to more enjoy cycling and make another step to an even higher level with his new team. The average age of the riders in Team Sky on 4 January 2010 was 27.4 years and together they represent 11 nationalities: 8 UK riders, 4 from Australia, 3 from Italy and Norway, 2 from France and 1 from Belgium, Canada, Finland, Spain, South-Africa and Sweden. The official team picture will be published here as soon as possible. The 26 riders of Team Sky in 2010 will be wearing a mostly black kit. On the chest the jersey contains a blue ribbon with the name "sky" in white letters. Above this ribbon the jersey shows the UCI ProTour and the Pinarello (bike supplier) logos. The collar of the jersey is blue as well and contains the Sky and Adidas (supplier of apparel and accessories) logo. The back of the jersey is predominantly white (black at the bottom) with a blue vertical line at the center and the Sky, Adidas and Pinarello logos on both sides of that line. On the side of the jersey the name of the rider and a flag indicating his nationality are visible. The typical Adidas "three stripes" are visible on the sleeves of the jersey. The bibshorts are black with the "three stripes" at the bottom and the Sky logo just above. The same look and feel is used for all clothing: the rain jackets for example are black with a blue vertical line on the back and the Sky, Adidas and Pinarello logos. The staff is wearing black clothing with a white top part and some blue details. The riders will probably have the same leisure wear. The Team Sky helmets are supplied by the Italian company Kask. Team Sky is using Pinarello bikes and their road bike is the Pinarello Dogma 60.1 which was first used by the Caisse d'Epargne team: Alejandro Valverde started using it at the Tour de Burgos and the rest of the team from the start of the Vuelta a España 2009. The particularity of this bike is that it's completely asymmetrical by design and the reason why that's useful is explained on the Pinarello Dogma mini-site and on the page dedicated to the bike on Team Sky's website. The bike is Shimano equiped with a Prologo saddle. So far it remains unknown which bike will be used for time trials. As you have seen by clicking on the links above, many information about Team Sky is available on the Team Sky website which uses the same "black/white with blue details" look and feel as the team's kit. The most interesting parts of the website will probably be the latest news, photos and video sections. Another interesting section will probably be the blogs section where Michael Barry, Simon Gerrans and Bradley Wiggins will regularly publish new articles. It is clear that Team Sky thinks that the communication around the team is almost as important as the performances on the road and it looks like they made a good start with their website. Many other teams could take it as an example. Let's just hope they'll keep up like this, but for a team which is backed by a media company I assume this will be the case! In addition to their website, Team Sky also has a Facebook fan page and Twitter feed. On the Facebook page, a real community has emerged in only a few weeks time. Team Sky answering the questions from fans on that page probably helps a lot in increasing the popularity of the page. Team Sky seems to be willing to make cycling accessible to anyone and not only the real cycling fans. It shows this for example by explaining on their website what neo-pro (first year as a professional) or rouleur (strong rider on the flat) mean. Below you can find a short video from Sky Sports about the Team Sky launch. Besides Sky as the main sponsor, Team Sky is sponsored by Adidas and Pinarello as their apparel and accessories and their bike suppliers. This means Adidas makes its come-back in professional cycling after having quit the professional cycling world with T-Mobile on 8 November 2007 (due to the recent doping cases in the team at that time Adidas decided to quit before T-Mobile did at the end of November 2007). In the article Dream to reality - Four years of hard work comes to fruition, Sky describes how Team Sky was born early 2010 since the first discussion about a British team between Dave Brailsford and Shane Sutton in March 2006! Zeer belangrijke medespeler op het hoogste niveau voor het komende wielerseizoen. WELCOME CHAMPIONS. The Sky is the limit ! A part Nicolas Portal , les autres connais pas..avec cette nouvelle équipe et certainement celle de Lance Amstrong , il va y avoir de la nouveauté sur le TDF 2010...!! Le nouveau Team Sky veut gagner le Tour , c'est comme au temps de Jeanne d'Arc quand les anglais voulaient être les maitres de nos villes, de nos vignes et campagnes, d'Aquitaine à Rouen. Heureusement que la France possède maintenant deux gars bien musclés pour défendre notre honneur, les sieurs Nicolas Sarkozy & Portal. Mais il faudra des supporters assertifs ayant plus de connaissance et de passion, avec un Nath Vaucaire qui ne connaît que 1/26 on n'y arrivera pas. Heureusement qu'il est branché sur paris.thover.com qui nous informe si bien sur le cyclisme international - mondial est un meilleur adjectif- de la nouvelle décennie, et que donc l'ami Nath va s'ouvrir les yeux et l'esprit sur ces champions énormes comme Wiggins, Boasson Hagen, et les autres , ... que l'on va voir devant en course et dans les résultats. HO HOOOOOOOOOOOO...!! Sieur Journée déja , je ne suis pas "un" mais "une" Nath diminutif de Nathalie chanson chanté par Gilbert Becaud..! !je vois que vous êtes doté d une très grande culture générale en employant des termes de l hymne nationale de notre pays pour vous exprimez!!! facile avec tout ce que l'on trouve avec le net.!! Mais mon père avait raison , lorsqu il me disait que l instruction ne fait pas d' une personne,quelqu un d' intelligent, la preuve ce soir. Ne seriez vous pas anti Francais ??? je pense que oui..!! le faite de ne pas connaitre tout ces sportifs certainement de grand talent soit une tare pour aimer le cyclisme , ALORS mon petit pépère il ne faut pas être frustré de cette façon et d agresser les gens qui sont ici pour s exprimer librement. Et oui je m informe sur paris.thover.com , car en la matière on ne fait pas mieux..!! Bonne soirée , prenez une tisane au thé vert cela détend . Pas de Natashquan mais de mes campagnes du plat pays sous la neige où sur les Anglais-Hollandais le 29 juillet 1693 la France avait remporté à Neerwinden une grande bataille, ni du froid Leningrad où la fille de Nathalie fait son droit, je me recroquemitoufle au creux de mes pantoufles dans l'esprit d'Amade et de Delannoé, et votre réponse ma chère Nathalie, malgré Grévisse qui aurait écrit certains mots autrement, me fait plaisir comme une symphonie de Silly. Sachez que j'aime beaucoup Bécaud et le cyclisme, depuis Stan Ockers et Rik Van Looy. J'aimerais au Café Pouckine boire un chocolat chaud avec toi, Nathalie, et te décrire mes émotions que j'avais vécues dans l'ascension du Hoover Pass sous la pluie ou sur les routes chaudes dans le Delta du Mekong, ou sur la Via Appia Antiqua que j'avais parcourues à vélo. Nous allons donc ensemble supporter le Team Sky. Salutations amicales. Papoum. www.blog.seniorennet.be/Wilfried_1944. Bon ... on va pas se battre ici ! Complètement dans l'esprit de Team Sky, mon site ne s'adresse pas qu'aux férus de cyclisme, mais essaie aussi de rendre le cyclisme plus accèssible pour ceux et celles qui s'y intéressent mais qui ne connaissent pas toute l'histoire du cyclisme ! Voilà, j'espère donc que ce blog arrive à s'adresser à cette cible très large et ce dans une bonne entente ! @Jonas : die opmerking heb ik vaker gehoord. Het vlaggetje is er eigenlijk alleen maar om de taal aan te geven en niet de nationaliteit. Ik zou eventueel een Belgisch vlaggetje kunnen laten zien als in de gebruikte browser "nl-be" of "fr-be" als voorkeurstaal ingesteld staan? Ik weet alleen niet in hoeverre dat het geval is voor mijn Belgische bezoekers! In principe geen probleem met vlaggetje. Ze zijn in dit geval van jouw voorstellingsproblemen zelfs nutteloos, overbodig, want door de gebruikte taal van het ingezonden emailbericht weet iedereen toch welke taal het betreft! Maar indien -zoals nu zo mooi eenvoudig op de zijkant van de SKY-truien de naam van de wielrenner mèt bijbehorend vlaggetje van zijn nationaliteit vermeld is- zou de voorkeur moeten kunnen gegeven worden aan ofwel nationaliteitsaanduiding door de vlag, ofwel géén vlag.